There is 1 review for 'Alphadia 2'. I recently finished both Alphadia 1 and 2, and this is what I have to say: In my opinion, I find Alphadia 1 the more enjoyable experience, even though I spent a lot more time on 2, and I will be getting into why that is in a bit. Starting with improvements, Alphadia 2 has the Break System, which is kind of like Limit Breaks, although it takes longer to fill. Considering as the game is overall harder, it’s a good thing to have more options. One of the major gripes against Alphadia is that outside of the secret boss, the game could be nearly won on autoattack, and this was the case even for the final boss if you were properly leveled. Not so here. The game is much harder, although never really overly so. Another plus side is the fact that the number of confusing dungeons have been cut down, and most new ones have been made easier. Even the horrifically complex Schwarz Pass is streamlined a bit. There are some complex dungeons latergame, such as the final dungeon which is incredibly long and complex, but I have no problem with that. Now, unfortunately, for the downsides. Let’s put this into perspective: Alphadia 1 starts when main character Ash and his friend Karim find two people being attacked by knights. As they’re on guard duty, they fight off the assailants, only to discover that they were from the Schwarzchild Empire and they had made enemies of them, being forced to flee the town with the people they saved and their friend Eclair. Alphadia 2 starts with main character Leon doing a mission for the Energi Guild (introduced in the first game), and on the way out meets Milfy (she of the awkward name) who is there to meet him and travel back to the Energi Guild. Story-wise, Alphadia 2 is… bland. Which is a vast downgrade from Alphadia 1. Every character in Alphadia 1, even the less important like Eclair or Weid had legitimate character development and were interesting in their own right, and the two protagonists, Ash and Shion, changed entirely throughout the story. Meanwhile, I can’t think of any character who undergoes any development, except Leon to a slight extent, and that is completely ignored by the end. The rest of the characters end the game pretty much the same way they began it character-wise. Another major gripe I have is that the entire story is spent in the shadow of the protagonists from Alphadia 1. Every thing you do is done because Enah (from the first game) tell you to as guildmistress. Even in the last dungeon, you go there because Enah tells you to. The game repeatedly tells you that Ash is better than your entire party, even at the very end, Ash saves your party against the final boss, and in the True Ending, it’s Ash and Shion who save the world while you watch. I find that to be extremely annoying. I didn’t play the second game to be told how cool and amazing the first game’s protagonists were. I want to watch these people grow and become heroes in their own right, not lackeys of an Alphadia 1 character who stay in the shadow of the Alphadia 1 protags. Furthermore, as a minor gripe, there was no hint of what Baroch really was, in fact his behaviour made him seem different. He acted like a selfish mercenary, even in his thoughts, and not like what he actually was as some sort of Planet’s Judgement type thing. Finally, one thing that was a problem in both Alphadias was the lack of a proper lategame grinding place. IT can take you many, many hours to get to that level 99, which is needed for the super boss (and even then you’ll get the floor wiped with your face, and that’s fine!) – I enjoyed that the True Ending was locked behind him, even if I was truly freaking out about how tough the super boss was. And of course, if you want to unlock everyone’s final Break skill, that’s a ton of work too. DO NOT USE BAROCH. DO NOT USE BAROCH. [Solved]Where’s the thief for mission 21? Normal Ending Obtained – What now? 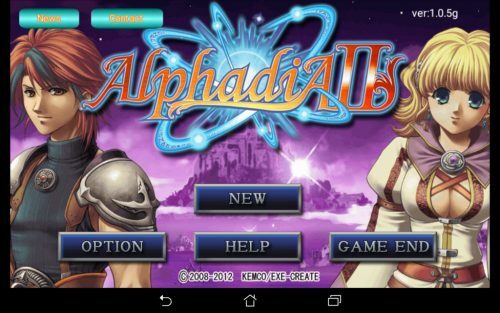 Alphadia 2: Infinitely better than the original!